The reservoir was emptied in 2015 after a new underground reservoir was constructed nearby, leaving behind an empty, 45-foot-deep dust bowl. 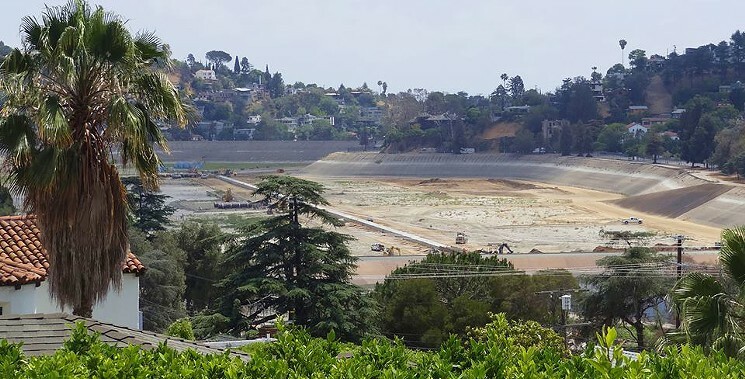 Los Angeles Department of Water and Power (DWP) officials announced in late March that the recently decommissioned Silver Lake Reservoir will be refilled over the next few months. The reservoir was emptied in 2015 after a new underground reservoir was constructed nearby, leaving behind an empty, 45-foot-deep dust bowl. Neighbors have been debating for months over how—and with which type of water—the reservoir would be refilled. After record rains this winter, the DWP officials decided to use the reservoir as a dumping ground for excess water in the Los Angeles aqueduct system and have pledged to refill the reservoir to its “historic levels” moving forward with non-potable water. Still in question, however, is if an ambitious plan presented last summer by Mia Lehrer+Associates (MLA) and the group Silver Lake Forward aimed at converting the 96-acre reservoir into a dynamic, multi-functional habitat and recreation space will move forward. The plan contains various proposals for utilizing the decommissioned reservoir in a more environmentally suitable manner and would contain, among many components, hatcheries for local and migrating bird populations.